In an another FAQ, I showed how to construct a piecewise function from a tax table on Arizona’s Form 140 Income Tax Form. Other states have descriptions of how income taxes are collected. 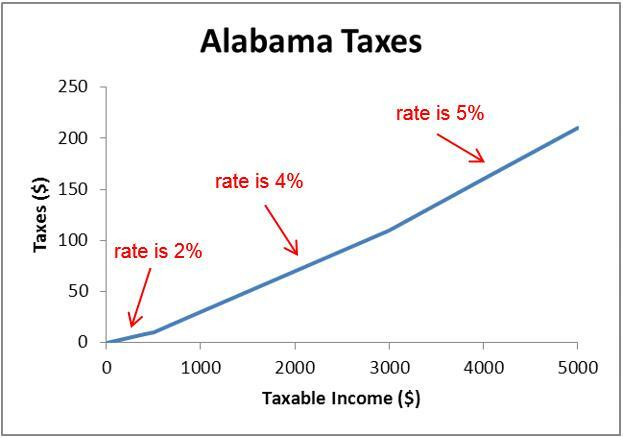 In 2008, the following description was used to calculate state income taxes in Alabama. For the first $500 in taxable income, the tax rate on that income is 2%. For the next $2500 in taxable income, the tax rate on that income is 4%. On all additional income, the tax rate on that income is 5%. Let’s use this information to construct a piecewise function T(x) for the income tax as a function of the taxable income x. This is because 400 of taxable income falls in the first 500 of taxable income. In this case, the tax is 2% of the taxable income. Now let’s look at a taxable income that brings a third rate into the picture. This reflects the information on where the different tax rates apply. This yields the equation y = 0.04x – 10. Does this surprise you at all? The slope is the tax rate for that section. The graph of this function is shown below. Notice that as the rate goes up, the graph gets steeper. Previous PostPermutation or Combination?Next PostHow Many Possible License Plates?